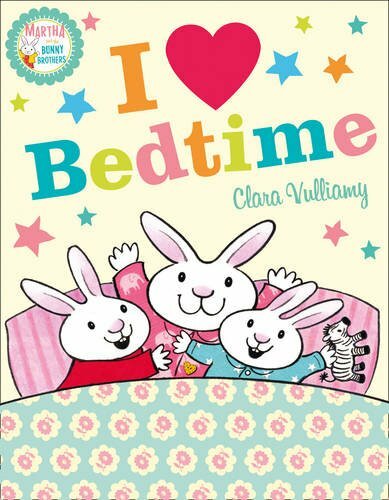 The antics of the adorable bunnies in I ♡ Bedtime make my daughter giggle uncontrollably – any book that produces such mirth and merriment in a child is also a winner with me! The Story: Martha is trying to get her bunny brothers, Monty and Pip, ready for bed so that she can have some special time alone with her best babysitter, Grace-next-door. Unfortunately it is not easy as Monty and Pip use a series of delaying tactics to disrupt the bedtime routine. Giving the dog a bath, pretending to be super bunnies, choosing pyjamas, giggling, avoiding sharks and practising gym all take time and cause great excitement but finally Martha’s special bedtime bunny song sends them to sleep so that she can have time with Grace-next-door. This beautifully illustrated story is told by Martha. Although Mum and the babysitter are mentioned, Martha, her two brothers and their dog, Paws, are the only characters shown in the pictures. Martha starts the story by showing the reader her bedroom and some of her best things then tells us that Grace-next -door will be babysitting while Mum and Dad go out. The story continues with a wonderful array of colourful, busy page spreads showing the bunnies’ bedtime preparations and procrastinations. The text is easy to read and I like the way that a range of fonts is used. A variety of large and small pictures add to the interest and Clara Vulliamy has included so many little details that are important for young children, eg. the names of all Martha’s soft toys and the colour of each bunny’s toothbrush. I ♡ Bedtime contains many humorous touches that parents of young children will also identify with, e.g the child who insists on constantly wearing wellington boots or the child who likes to wear a cardboard box on his head! My daughter loves the pictures of each bunny’s bath toys and spends time choosing her favourite pyjamas for Martha. 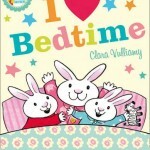 All the elements of bedtime are included which means that readers, young and old, will easily identify with the story. You can listen to The Bedtime Bunnies’ Song on Clara Vulliamy’s website. Quote from Jessica (aged 4): ‘They are such funny bunny rabbits. He looks like a unicorn.’ (referring to Monty’s ears when he is in the bath). This is a beautifully illustrated bedtime story which adds wonderful comic touches to the familiarity of the bedtime routine. Loving your blog so many great books. I also feature childrens literature and author interviews on my blog every Monday. I would love you to pop over and see some of the author interviews that I have done! I’ve never read these books – and never will, my kids are way too old! But it sounds entertaining. Kind of reminds me of Charlie & Lola in that you never see the grown ups and it’s always Charlie getting Lola to do things. You’re right! I’ve never made a connection between Charlie and Lola before.